December 16, 2015 December 16, 2015 / Elizabeth T.
But today, I’m finally back with an outfit post! 😀 After all, fashion’s not only one of my favorite topics to write about, it’s also the reason I started this blog in the first place! So without further ado, let’s take a look at this holiday-inspired outfit! For the beautiful holiday season, you can never go wrong with plaid, and I put my outfit together with Christmas’s most-loved pattern in mind. There are so many different variations of plaid, but the holiday theme largely revolves around reds. But rather than choosing the traditional red-and-green combo, I decided to opt for a red-and-navy skirt that has very subtle pops of green to make the overall look a little softer (and more wearable). To complete the whole Winter Wonderland look, I opted for one of my newest eyelash sweaters in ivory. Not only are they super warm and comfy, they also look so cute and chic! The best part is that they can be dressed down with jeans, but likewise, they can be dressed up with skirts too. They’re really perfect for the holiday season since the top’s so fashionable, but at the same time, it’s still a sweater, so you won’t have to sacrifice style for comfort (or vice versa because, let’s be real, no one wants to look like a rockstar but be freezing their butts off at the Christmas or New Years party). To combat the chilly weather, I have on a super thick pair of tights. They’re so comfortable and cozy, so they’re perfect for the holiday season when you want to wear a pretty skirt or dress for parties or a night out. And of course, I topped off the whole ensemble with a statement gold necklace and my favorite dark brown suede ankle booties for a sleeker and more put-together vibe. Thank you love ❤ 🙂 The booties are my fave too! You look very cute! Adore that skirt! Thank you so much Mara 🙂 The skirt is so festive, isn’t it? Thank you so much Mary ❤ 🙂 Have a great day too! 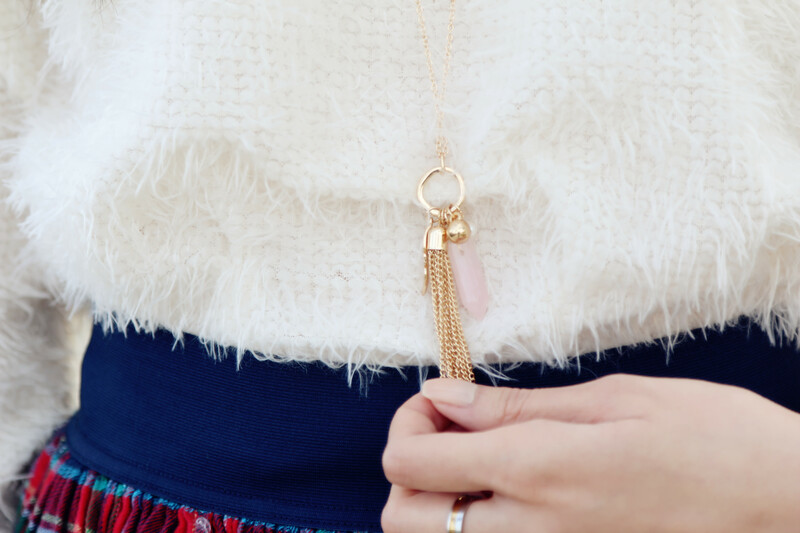 Such a cute look – love the necklace too! Nice style, i love your sweater, it looks so cozy. Aww thank you so much Rachel! You’re too sweet! 🙂 I never thought of it too, but then one day, I was just looking in my closet and thought the two would make for a very interesting winter outfit, and voila! ❤ Glad you liked it! Anyway, I love this look so much. Such a cute combo of a plaid skirt & a fuzzy sweater! Beautiful. You looks so beautiful!! Love your feather sweater and skirt!! You are wearing two of my favorites – eyelash sweater and plaid. The outfit looks adorable. Yes, plaid is perfect for the winter, especially the holiday season ❤ Haha I didn't really ask for anything, but I just want the next year to be an even better year, where I can learn and grow even more 🙂 And yes, Uggs are such a great investment! 😀 They're some of my favorite shoes! Your outfit is definitely perfect for the holidays! Heheh thank you so much Kelly ❤ They're some of my favorite shoes as well 🙂 Merry Christmas!